Blazon: Vert honeycombed, two bees in fess and a chief indented Or. Arms was registered in December of 1992, A.S. XXVII. Blazon: Per bend azure and vert, on a bend engrailed argent between six mullets of six points Or a fox's head erased gules. Arms was registered in April of 1985, A.S. XIX. Name was registered in August of 1991, A.S. XXVI. Name was registered in March of 1988, A.S. XXI. Blazon: Per chevron argent and Or, three flames proper, each charged with a tower sable. Arms was registered in July of 1988, A.S. XXII. Name was registered in April of 2004, A.S. XXXVIII. Also known as: Thornbjorn Hrafnasson of Ravenscroft. Blazon: Per bend sinister argent and azure, in bend three fleurs-de-lys counterchanged. Arms was registered in April of 2004, A.S. XXXVIII. Name was registered in November of 1988, A.S. XXIII. Blazon: Vairy gules and Or, a dragon segreant to sinister sable. Arms was registered in November of 1988, A.S. XXIII. Name was registered in November of 1989, A.S. XXIV. Blazon: Purpure, on a chevron throughout Or three fleur-de-lys palewise gules, in base a fleur-de-lys Or. Arms was registered in March of 1994, A.S. XXVIII. Name was registered in September of 2007, A.S. XLII. Also known as: Genevive of Vatavia. Blazon: Per chevron inverted sable and argent, a pair of eyeglasses Or lensed argent and a lit candle gules. Arms was registered in September of 2007, A.S. XLII. 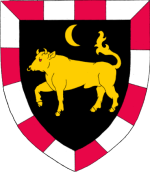 Blazon: Sable, a bull passant, in chief a decrescent Or, a bordure compony gules and argent. Arms was registered in August of 2009, A.S. XLIV. Name was registered in February of 2002, A.S. XXXVI. Blazon: Argent, a castle sable portalled of a wooden gate proper and a bordure azure. Arms was registered in February of 2002, A.S. XXXVI. Blazon: Azure, two conies combatant and in base a crescent, a chief nebuly Or. Arms was registered in June of 2013, A.S. XLVIII. Also known as: Gregory McPherson Mills III. Name was registered in September of 1991, A.S. XXVI. Blazon: Per bend gules and sable, a horse rampant and a sword bendwise inverted argent. Arms was registered in September of 1991, A.S. XXVI. Name was registered in September of 1992, A.S. XXVII. Blazon: Gules, a dragon segreant Or, winged argent, belly pierced by an arrow, and on a chief Or three arrows bendwise, each surmounted by a bow bendwise sinister inverted sable. Arms was registered in September of 1992, A.S. XXVII. Blazon: Quarterly argent and gules, a cross crosslet quarterly sable and argent, in sinister canton a daisy proper. Arms was registered in December of 2014, A.S. IL.